What is galvanic corrosion and why does it matter to a home owner? Let’s start with what corrosion is. Corrosion is the gradual destruction of metals through a natural process which converts refined metals into more stable forms including oxides, hydroxides and sulfides. For example, when a piece of iron rusts, it is the transformation of iron into iron oxide. Galvanic corrosion is an electrochemical reaction that occurs when dissimilar metals are in contact with each other and immersed in a common electrolyte solution capable of carrying an electric current such as salt water, rain water and even city water that has additives added. A great example of this is in steel boats and sea water. Steel boats will rust in the presence of sea water and so it was discovered that by adding a sacrificial anode such as zinc metal to the hull of a vessel, the corrosion could be directed towards that material instead of the hull of the boat and the sacrificial anode can be easily replaced as necessary. How does this relate to my home? Your water heater, for example, has a sacrificial anode rod typically made of aluminum, magnesium and/or zinc to protect the inner steel water heater tank. Periodically, these anodes need to be replaced as they are consumed, and sometimes there may be a small amount of debris in your hot water supply from a deteriorating anode. 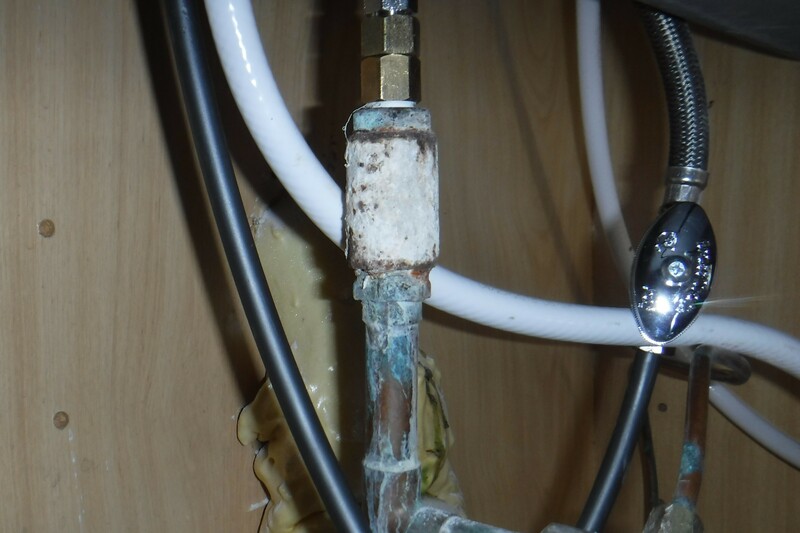 Galvanic corrosion can occur at the water heater’s cold and hot water supply connections if dielectric unions are not used. Dielectric unions prevent the contact of dissimilar metals at plumbing connections. In the sample image, a galvanized steel fitting is installed between two copper pipe fittings, and you can see that the galvanized pipe fitting is significantly corroded and may leak or fail in the future. Galvanic corrosion is not just limited to plumbing connections but can occur anywhere that dissimilar metals are in contact with each other and in the presence of moisture such as, metal roofing and its fasteners and at electrical connections. Contact us today to schedule your home inspection.